As of press time, (former?) 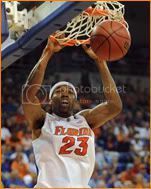 Florida Gators junior forward Alex Tyus has less than two days to decide whether he will leave the University of Florida for good or remove his name as being eligible for selection in the 2010 NBA Draft. Tyus submitted his name to the NBA for evaluation on April 7 without hiring an agent, allowing him the ability to return school if he so chooses as long as he makes an official decision by May 8. One month ago, Tyus said he would not leave Gainesville, FL, unless he is projected to be a first-round selection. In preparation for his decision, Tyus worked out at IMG Academy in Bradenton, FL, to get ready for NBA workouts that he completed over the last few days. By this point, he should know exactly where he stands and have a decision made. If he chooses to leave the program, the criticism and low grades he has earned from analysts suggest that Tyus will likely go undrafted or be selected at the back end of the second round. Should he stand by his original statement, he will be wearing a Gators basketball uniform for the 2010-11 season. Then again, there is also the possibility that his decision may be fueled by more than just his draft projection, considering he almost transferred away from Florida after the 2008-09 season before being convinced to stay by head coach Billy Donovan. 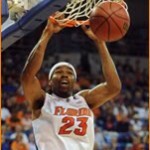 Will Alex Tyus keep his name in 2010 NBA Draft? It seems there have been alot of transfers and people considering transferring out of Billy D’s program…Whats up with that. This isn’t a transfer situation. Looking at statistical significance, Florida basketball’s transfers are no different than a number of teams in the SEC (and many other major programs in the nation) over the last few years. There have been some bad fits and others who probably should have gone elsewhere in the first place (Jai Lucas). I would like to see Tyus back, but his play is so erratic, it may be time to build the team without him next season. 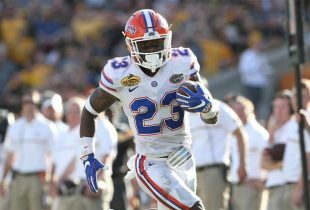 Has anyone else seen some posts that indicate Beal may decommit from UF. That would be a death knell for Donovan, who seems to be regressing in recruting and developing talent since the 04’s. I would love to Calapari bolt UK for NBA. Teach them a lesson about one and done. The stuff about Beal has nothing to back it up – no source, no quote from the player, etc. I think Beal is quite happy with his commitment to the Gators and do not expect him to go anywhere. Adam, maybe you are right and my words were not reflective of what I mean. Maybe Billy is doing less with more. The 04’s were 3* type recruits (maybe Brewer was 5*). We seem to be less a team with more talent. Our greatest success has come with great teams. I think back to 1994 with Brown, Cross, DeClerq, Da Meat Hook. Not the greatest individual talent, but a great team. Unfortunately, finding that magic combo is few and far between, and is has become clear you need major talent infusion every year to stay an elite team. Im just glad Im not the coach because I get a headache just thinking about it. Exactly – it is about the teams, not the players. But Donovan and the Gators do not attempt to recruit the same way Coach Cal does nor should they, in my opinion. If you want to build a “team,” you do it with guys who will invest in you and your program for more than one year – often times more than two years. You cannot accomplish that solely with one-and-done players. You can use those guys as compliments to put your team over the top, but not as the foundation for success. That’s ridiculous. Tyus could never guard a small forward. Plus he’s not that great of a shooter. Bye, bye, Tyus. Shoot, put a healthy Kadji next to Macklin or Murphy at least plays hard. Tyus seemed talented but never willing to put in the work.